2W Beach Hoste is with convenient location, just across the road from the beach at Bangrak. Various restaurants, bars, convenience store, city town are nearby within a distance of 500 metres. There are 5 private rooms and 3 dormitory rooms in the hostel. - Every private room very comfortable full facilities such as lcd. tv, bluray dvd player, air condition, hot water, hair dryer, wardrobe, micro wave, kettle, balcony. - The dormitory very comfortable, private bed with curtain, light, power plug, wardrobe is big enough for backpack, clean and safe. Guarantee pay less get BIG! Other service such as open air bar with the wide screen sea view, big swimming by the ocean, tour desk, transfer service, motorbike bicycle car for rent, money exchange, vending washing machine. Guarantee you will feel like a stay at home! By our concept pay less get BIG! Our place is located at Bangrak beach. From the Bangrak pier just walk along the road by keep the ocean on the right handside just 5 minute you will see the Rae-Ra restaurant on the right. 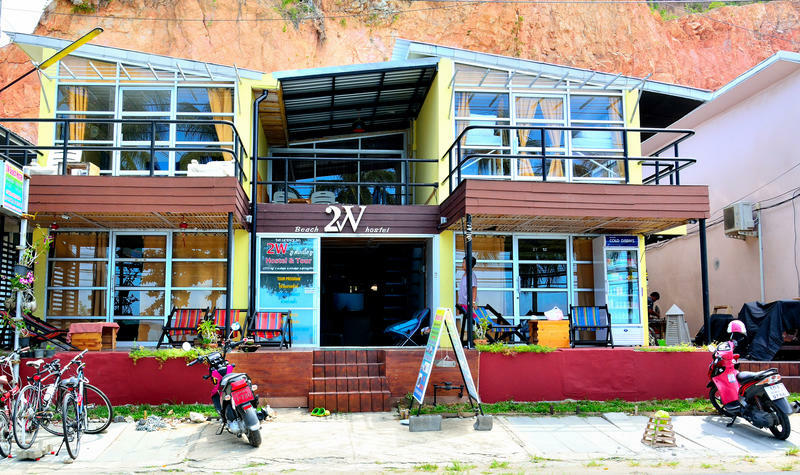 A little bit forward on the left you can find us... 2W Beach Hostel. -From airport take the public van direct to us just 4 km. -Bus and train from main land catch the public Tuk Tuk Bangrak route. From there take about 18 km. When the first turn left at the Bophut light junction just 1.8 km. you will be already in our place.